Lovers of the classic western, feast your eyes on the second film adaptation of Charles Portis' 1968 novel of the same name. The first adaptation back in 1969 starred John Wayne who actually scored his only Oscar for his portrayal of U.S. Marshal Rooster Cogburn. I haven't seen that flick but with an Oscar worthy performance by John Wayne, I'm going to assume it was good. The latest adaptation features Jeff Bridges taking on John Wayne's role as U.S. Marshal Cogburn with Matt Damon riding by his side as Texas Ranger LaBoeuf. Together they set of on a bounty hunt of Tom Chaney (Brolin) to bring justice for murdering the father of Mattie Ross (Steinfeld). The trailer for this movie looks very cool but unfortunately a little misleading. I got the impression that there would be lots of gunslinging but that was not the case. Still, the movie that I actually saw was pretty good. It was a no-frills, relatively non-hollywood western and it didn't have any magic tricks or misdirection. It was a no-nonsense story about a 14 year old girl that hires a U.S Marshal and a Texas Ranger to capture the man that killed her father. As much as this movie is about catching the bad guy, it's also the story of Mattie Ross and U.S Marshal Cogburn and their long, difficult journey. I was a little uncertain about Damon's casting to begin with but he fit in quite well. Jeff Bridges was great as the stubborn, drunken old Marshal struggling to deal with his own mortality and is in the running to win his second consecutive Oscar for best actor following his stirring performance in Crazy Heart. Hailee Steinfeld? Write that name down because it's not the last we'll hear from her. She was brilliant. Better than Bridges I dare to say. Not sure who her fellow Best Supporting Actress nominees are but, look out! The simple plot line of this movie is carried by some solid acting and characters across the board which makes the movie what it is. 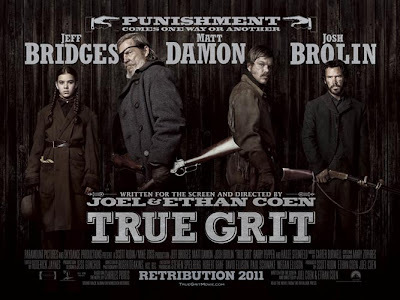 True Grit is nominated for 10 Oscars, to be held on February 27, including Best Picture, Best Director, Best Adapted screenplay, Best Actor (Bridges) and Best Supporting Actress (Steinfeld). This is a good old fashined western. Take your dad and your grandfather to see it.